Welcome to this newest incarnation of "Div's Crib". The website is broken down into some interesting topics which include hockey, network security/encryption/privacy resources; a section dedicated to the Atlanta based rap group OutKast; tribute to the very talented actor/comedian Eddie Murphy and some links to web sites of my friends and other interesting online content. Even though lacrosse is Canada's official national sport, the country's heartbeat is more closely tied to hockey. For those of you wondering about the kind of hockey, the word "hockey" implies "ice hockey" in Canada. The sport originated during the 1870s in Windsor, Nova Scotia and has since spread across the world. Played on a thin sheet of ice, with sharp edged skates, a "stick", round frozen puck and two goal nets, the object is quite simple - put the most pucks as possible in the net. Computer security is a wide ranging field that looks at securing data networks that we grow to rely on. At present, the information technology field is playing a cat and mouse game with the hackers, crackers, virus and worm writers. The latter expose a vulnerability or release a new rogue virus and the security companies try their best to play catchup and minimize the damage. Apart from these aspects of computer security, the Internet is also exposing problems that come with managing large amounts of data. Much of this data contains personal information, so things like online privacy and encryption also warrant more consideration. This section of the site includes many resources relating to security, hacking, encryption and online privacy. Eddie Murphy is one of the funnier actors/comedians that I have seen. Sure, he hasn't been able to replicate his early success over the last 10-15 years, but that early work he did both on his standup routines plus on the television and movie acting side was nothing short of hilarious. From his roles on Saturday Night Live, to his standup comedy tours and movies like the Beverly Hills Cop series, Eddie has brought a lot of laughter to millions. Atlanta, Georgia is home to many great artists but when it comes to rap music, OutKast have by far been the most famous act to have come from this "Motown of the South". 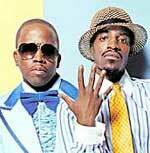 OutKast is comprised of two members; Andre "Andre 3000" Benjamin (Dre) and Antwan "Big Boi" Patton. To date, the group has released six albums and sold over 20 million records, putting them in the top echelon of the all time greatest hip-hop/rap artists.